Washington, April 7: US President Donald Trump has claimed that asylum seekers look like Ultimate Fighting Championship (UFC) fighters, the media reported. He made the remark while addressing the Republican Jewish Coalition in Las Vegas on Saturday, reports CNN. "Some of the roughest people you've ever seen, people that look like they should be fighting for the UFC," he said, referencing the mixed martial arts promotion company. "They (asylum seekers) read a little page given by lawyers that are all over the place -- you know lawyers, they tell them what to say. You look at this guy, you say, wow, 'that's a tough cookie'." The President also mocked those supporting asylum as being in denial about migrants' motivations. "Oh, give him asylum -- he's afraid, he's afraid!" Trump said, imitating the supporters. "We don't love the fact that he's got tattoos on his face, that's not a good sign. We don't love the fact that he's carrying the flag of Honduras or Guatemala or El Salvador, only to say he's petrified to be in his country." Donald Trump Performs Malhari! US President Replaces Ranveer Singh in Bajirao Mastani Song in This Viral Meme (Watch Video). 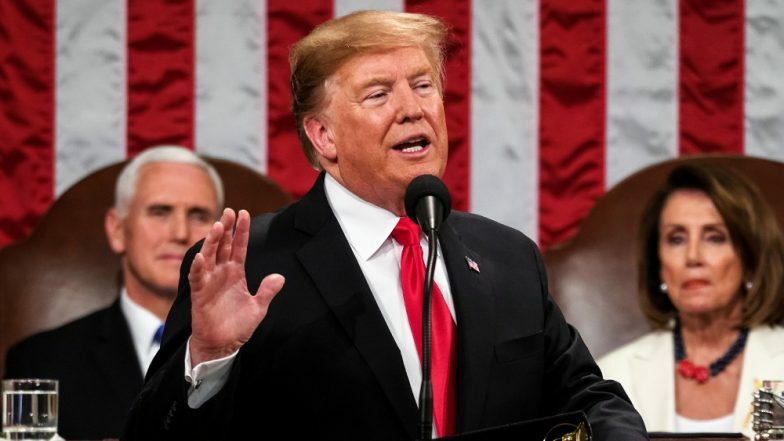 Trump also justified his decision to cut aid to those three central American countries, known as the Northern Triangle, for their role in caravans travelling to the US. "The Democrats say, 'how dare you do that, that money is used for all this good'... But no it's not, it's largely stolen," Trump said. "Now if their government wanted to, I have a feeling they'd be able to stop caravans from forming in those three countries... They're pretty tough, they're pretty tough down there. And, but they didn't, so I stopped the payments," he added. Trump also reiterated his remarks Friday that "our country's full".